If you are an American child, then most likely you enjoy celebrating The Fourth of July. On July 4th, we celebrate our Independence from Great Britain. Since the Declaration of Independence was signed on July 4, 1776...we observed ourselves as an Independent nation. Americans typically celebrate The Fourth of July with fireworks, barbeques, picnics, concerts, parades, outside parties, and other fun festivities. We also love to hang up or wave the US flags to show how proud we are to be Americans. We typically wear red, white, and blue to show our American pride. But some ideas would include crafts that are red, white, and blue as well as anything with stars and stripes. Also patriotic celebrations often include throwing confetti so making a confetti blower would be a great festive idea. A red, white, and blue pinwheel would be both fun and easy to make and it would be fun to watch a parade while holding one. 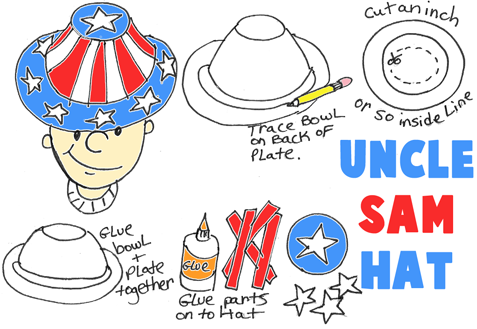 Some other neat ieas are Making a US Flag pin ... decorating a t-shirt with patriotic colors ... putting red, white, and blue streamers on your bike ... Making an Uncle Sam hat ... Fireworks art ... For More Ideas, please look below. Dress up like Uncle Sam and march proudly on Independence Day. Ask your parents to save you an empty Quaker Oats Oatmeal Box. Cover the entire box with white paper, except for the bottom, which should covered with red paper. 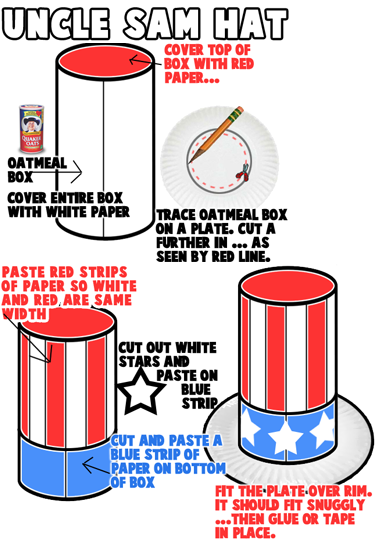 Then trace the oatmeal box onto a paper plate. Then cut further in, on the red-dashed line that you see in the picture above. Then Paste red strips of paper so white and red are the same size...as pictured above. Then cut and paste a blue strip of paper on the bottom of the box...as seen above. Cut out white stars and paste on the blue strip. Here is a lesson on how to draw stars. Now fit the plaste over the rima nd it should fit snuggly. Then glue or tape in place. Here is a lesson on making your own costume beards (scroll down on that page to get it). These turn out great and really look like fireworks. These are easy enough to make that young children such as preschoolers, and children in younger grades can even make them. Just use watercolors or food dye to color coffee filters red, white, and blue. Then let them completely dry on paper plates or trash bags. Then cut strips all around the circle coffee filters. Leave the center of the coffee filters un-cut. Then use chenille stems (pipe cleaners) to poke thru the center of the coffee filter. Twist it down at the top to keep the stem intact. Now pull the cut sections all around the stem to look like fireworks...pulling some down, some up, etc. They should look like the picture on the right. 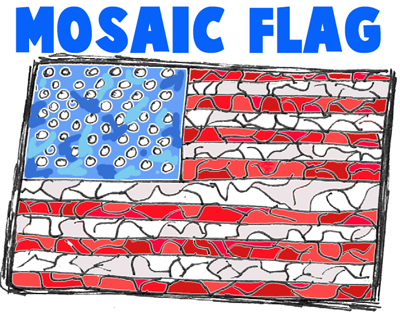 This ia great patriotic project to do with a bunch of kids. Have them all bring in red, white, and blue bottle caps from home that they have recycled. These will be used for the bottle cap flat mosaic. Use some sort of board to mount the bottle caps. Use a strong glue to attach all of the caps down. The flag doesn't have to be perfect....like the one above which only has 30 stars. This makes a great fourth of july decoration. 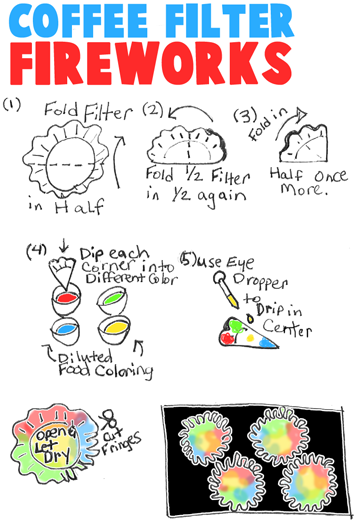 Make these beautiful fireworks from coffee filters. The above illustrations will guide you through the steps. (1) Fold a coffee filter in half. (2) Fold the coffee filter in half again. (3). Fold in half once again. (4). Dilute some food coloring dye with a little bit of water. Then put each color in a different dish. Then dip each corner of the folded coffee filter into a different color. (5). Use an eye dropper to drip fourth color in the center of the folded coffee filter. (6) Then open up the coffee filter and let dry on a paper plate. Cut little slits for fringes along the outer portion of the coffee filter. Then glue them all on black paper and you have a beautiful fourth of July fireworks picture. Draw a yellow star on the center of a paper plate. Here is a lesson on how to draw stars. Now cut out this star. Look at the 2nd picture above. It shows you how to pinch the corners of the stars inwards to make a cool 3-dimensional effect. If you want...you can write something on the star like 'JULY 4TH'. Then glue or tape red, white, and blue streamers ont he back of the star. You can tape a pin on the back of the star to wear it on your shirt. Or you can use them as house or bike decorations. Get an empty paper towel roll. Cover it with yellow or white paper. This is the flag pole. Cut 4 strips of 1" x 12" of red paper. Cut 3 strips of 1" x 12" of white paper. Then glue these strips of paper to the flag pole...starting with red at the top. Then cut out 6" x 4 1/2" blue paper. Then glue it on the top left of the flag that you created. Then stick star stickers or paper punched holes (circles) instead of stars. This is a simple flag to make for any age of child. Firstly, color or paint the back of a plate blue (or glue paper on it). Then, trace a white paper or styrofoam or plastic bowl on the back of the plate (if you don't have a white bowl - any will work). Now you should have a circle on your plate....cut just inside this line....so it is a bit smaller than the circle that you drew. Now glue the bowl and plate together. Now cut out some red strips of paper. Glue them on to the bowl so that there are white parts between (if you didn't start with a white bowl, then you will need to also cut out white strips of paper). Cut out a blue circle that is the same size as the bottom of your bowl (the top of your hat). Draw a bunch of white stars. Here is a lesson on how to draw stars. Glue a star on the top of your hat. Also glue white stars all around the rim of the hat. Now you have a great hat to wear proudly during July 4th celebrations. Be proud to be an American. Start with white paper. Also have a sheet of black paper handy. 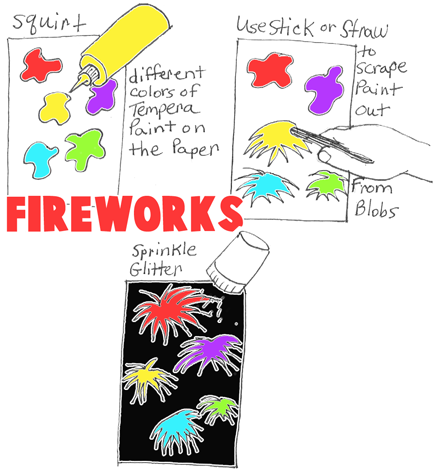 You will need different squirt bottles of Tempera paint for this project. Squirt different colors on the paper, as seen in the illustration above. Now use a craft stick, stick, or straw to scrape paint outwards from the blobs of paint. They will look pretty cool. Now let these completely dry. Then cut them out...leaving a bit of white around the edges. Then glue them on black paper. These turn out really, really cool. This is a great group project. Have a stack of magazines and have the kids rip out and cut out blues, whites, and reds from pictures and backgrounds of magazine spreads. Meanwhile the group leader can draw out a flag on a poster board or other large piece of paper or board. It doesn't have to be completely correct...depending on how long you have to complete the project. Then everyone glue the right colors onto the right parts of the flag. Every red, blue, and white won't be the same tint of that color so it turns out looking quite interesting and beautiful. For stars, you can just make white circles....or you can make stars if you have patient kids. 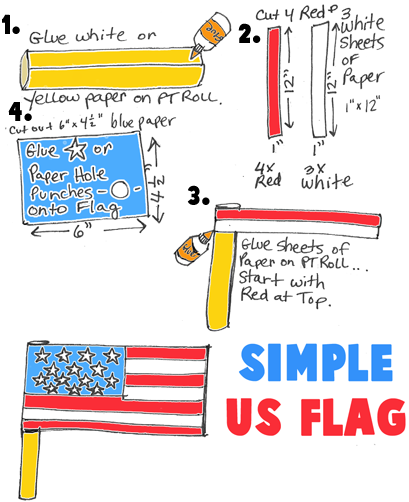 This is a great craft for preschoolers to make for Independence Day. 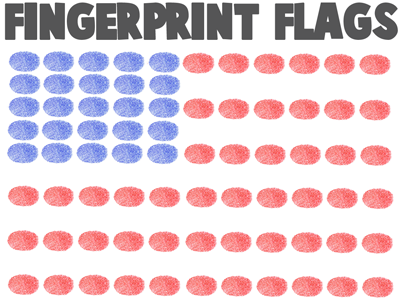 Just use fingerpaint and show them how to use blue fingerpaint for the blue rectangle part of the flag....and then show them how to make red fingerprints for the red strips. If you use white paper, you don't need white paint for the white strips of the flag. You can always use star stickers for the stars...but it looks good without it as well. This harmless play firecracker will make a noise that will sound like the explosion of a small firecracker. It would be fun to make for a Fourth of July celebration, or for any other time when you're in a mood to disturb the peace and quiet. Stretch 6 or more rubber bands, of assorted sizes and thicknesses, around the shoe box with its cover. Allow about a 1 inch space between the rubber bands. To make the Shoe Box Firecracker "explode," hold the shoe box on your lap, or between your knees, to brace it. With the fingers of both hands, lift several bands at the same time with each hand. Snap the bands sharply against the shoe box, releasing one band at a time, in rapid succession, and hear the "explosion." Maybe paint it red, white, and blue as well to make it more patriotic. The stars in the blue field of the American flag are five-pointed. It was Betsy Ross who convinced General Washington that it was a simple matter to cut a five-pointed star from a folded sheet of paper or cloth. And, you, too, will find it as easy to cut a five-pointed star if you will make a careful study of these sketches and follow exactly the directions given here — First fold a square of paper through the middle as shown in figure 1. With the fold at the top bring the right hand corner over to a point on the left-hand side of the sheet of paper which is about 2/3 of the way down from the left hand corner, as seen in figure 2. Then fold the upper right side over once more as indicated by the dotted line in figure 2. Now fold the left-hand corner of the fold over to the right edge, as pictured in figure 3. Cut across the folds at an angle, such as the one indicated in figure 4. If you desire longer and sharper points, cut at a sharper angle. 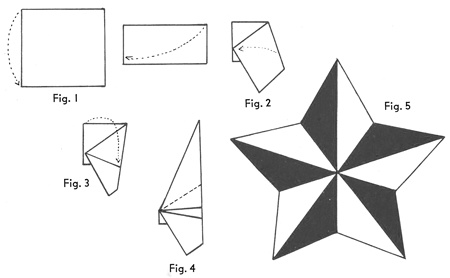 Your unfolded star should look like the one depicted in figure 5. Five-pointed stars can be used to make flags or to make patriotic banners. Patriotic US Flag Fans - Aren't these awesome - learn how to print and mae these patriotic fans...especially for US flags. How to Make a Confetti Blowing Pipe to Celebrate Festivities and Parties for New Years Eve - Tomorrow is New Years Eve so it is time to party (partaaaaaaaaaaaay). So how about making a toy confetti pipe to make cool little fireworks to celebrate the upcoming New Year. We will show you how to do this with the easy illustrated steps below. Have fun. Easy Pinwheel Pencil Craft for Kids for Independence Day on July 4th - I love making pinwheels with my kids because they get as much enjoyment out of it as I did. They are very easy to use and they only require a few supplies that most people have in their homes or home offices. 4th of July Flag Boats - Make these patriotic paper boats with the US flag. Perler Beads American Flag for Veteran's Day - Learn the pattern to make an American Flag with Perler Beads for Veterans Day. Make an American Flag Keychain - This is a great patriotic craft that you can take along with you yearlong to show your patriotism. Easy Cut Paper Stars - Learn how to make these 5 point stars, this is the way that Betsy Ross would cut out the stars on the first US flag. Colonial Tricorn Hat Badge - Celebrate the 4th of July by wearing a tricorn hat badge made from polymer clay. Patriotic Red White and Blue Pin - Learn how to make these patriotic decorative pins for the Fourth of July. Paper Star Ornaments for Christmas or 4th of July - make thse paper star ornaments for Christmas...find out with the following lesson. Painted 4th of July Flag Rocks - Paint patriotic paper weight rocks for Fourth of July time.